Check out these tubes of Stargazer UV body paint! 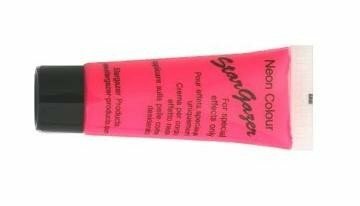 They are ace for special effects and to top it all, these neon face paints will actually glow in ultra violet lights. Stargazer recommends that for best results you can apply with a small brush to decorate your hair, body or face. The gold and silver stargazer face and body paints have a metallic sheen to them when on your skin. All colours are easily removed with water after use. Many customers have used this paint on fabric and have had no problems!